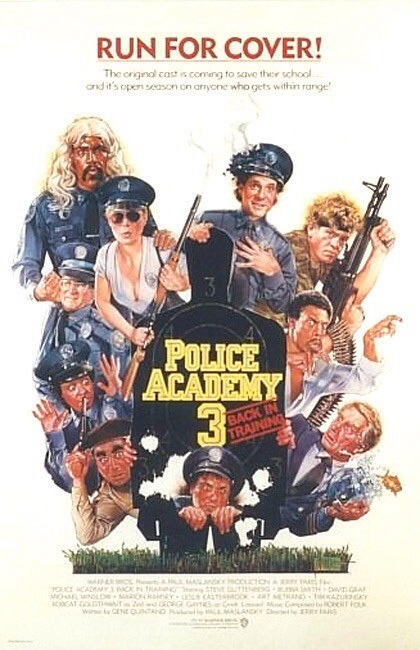 Released in 1986 Police Academy 3 was the first one to carry a PG rating as the original was rated R (the only one in the series) and the 2nd was PG-13. In many ways Police Academy 3 is a remake of the original with a couple of elements from the 2nd mixed in. In my opinion the original was the best in the series and while very popular I don’t think people remember it was actually quite funny and the slapstick comedy was a little restrained when compared to the sequels. Most people at least to me cite the 2nd film as the best of the sequels though me personally I’d go with part 5. Honestly the 2nd was for me was always one of the lesser films in the series (though far better than the 6th & 7th film). Police Academy 3 made a nice return after what I felt was a bit subpar 2nd film. All the Police Acaedmy films were released the very next year barley being a year and in some cases under a year (except part 7, which came out 5-years after the 6th). Whereas I felt the 2nd film was a little rushed it seemed at least to me WB was a little more prepared and Police Academy 3 was released just under less of a year from part 2 (8-days to be exact). One of the police academies will be shut down after a competition. Lassard (Gaynes) and his academy will do batter with the academy led by Mauser (Metrano). Members of Lassard’s police academy return to help train the new recruits including some familiar faces from the past film including Zed (Bobcat Goldthwait) and Sweetchuck (Tim Kazurinsky). The screenplay by Gene Quintano is light on plot and what there is in terms of plot is basically a rehash of the first film, but with that said it actually works well. While as mentioned this one came out less than a year after the last part, but the script seemed better prepared, but by the time the final act rolls around the script was running a little out of steam. The script is fun and the characters all have their standout moments. Police Academy 3 will never be confused with Oscar worthy material, but when all is said and done the script serves its purpose. Jerry Paris who directed the 2nd returns for the 3rd and this was the only time a director would return to direct another installment. This time around, Jerry Paris crafts a much better paced film with some highly amusing bits. This time around he has a slightly better script to work with and Paris makes a much funnier film this time around. 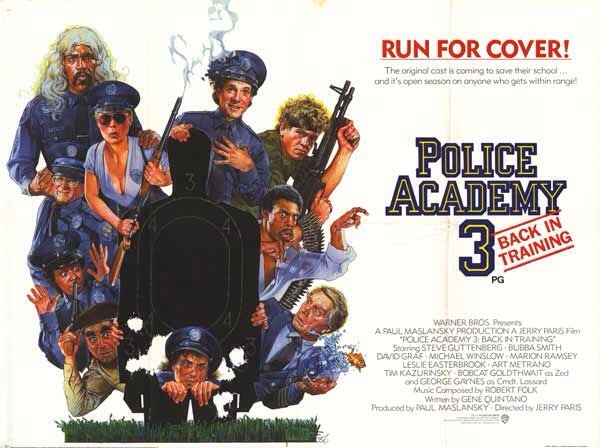 Running at only 83-minutes Police Academy 3 never outstays it’s welcome though the final act is a little overly long in my opinion. While not on par with the original it’s an effective comedy and the 83-minutes pretty much fly by. This would be the last we would see of Art Metrano as Mauser as in the 4th film and for the remainder of the series G.W. Bailey would return as Harris. It did take me a while to warm up to Metrano who is excellent in the two parts he’s in, but being so accustomed to Bailey it just didn’t feel right and while I still prefer G.W. Bailey since Harris is my favorite character Art Metrano is very funny and his scenes with Lance Kinsey are a riot! Leslie Easterbrook returns as to the series after not being in the previous film and that would actually be the only part she wasn’t in. The cast is again terrific and are clearly having fun. Overall Police Academy 3 in my opinion was a vast improvement over an ok part 2. These films aren’t meant to be taken seriously they’re just meant to be silly fun and Police Academy 3 pretty much succeeds.